While Mike and I were in Blacksburg we went to Starbucks (which is actually across the street from the apartment building I lived in while I was in college – it was a TCBY when I was there) and I tried the new Chocolate Banana Vivanno. It was something different, a change of pace from my normal Grande Java Chip Frapp. 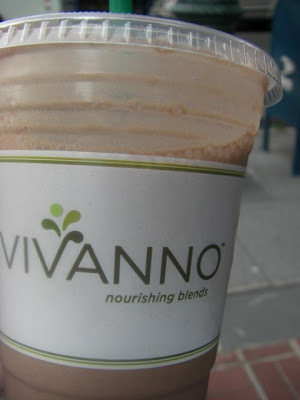 After going to the gym early this morning I was really thinking that I would like a Chocolate Banana Vivanno but the problem is it’s 50 miles to the nearest Starbucks. I stopped at the grocery store and got some bananas and here is what I came up with. It was really good – not quiet as healthy as the Starbucks version because I didn’t have protein and fiber powder. Emma isn’t a big fan of bananas so she asked me to make hers with frozen strawberries and it was surprisingly good – kinda of a chocolate covered strawberry taste. Give it a try and tell me what you think.